I'll readily admit that I did not want to go to the gym today. I had no real excuses to not go though. I was just feeling lazy to be honest. But, I did myself a favor and made myself go. I knew I'd regret it if I didn't go. I think part of my reluctance stems from a bit of boredom. I've gotten into a rut again with workouts. That and sometimes I just am flat out tired of seeing the inside of that place. But, that part aside, boredom all the way. So, I decided to try to do something a little different for my biceps/triceps workout. It's nothing earth-shattering. But it's a switch up from my typical 3 different supersets done as 3 sets of 8 reps....yawn. So, today I did 4 sets of 8 reps for two supersets then I did dropsets at the end starting with heaviest weight for 6 reps, then increasing the number of reps by 2 as I decreased the weights. I did this 4 times (6, 8, 10, 12). And you know what? This was a great workout once I got my rear in gear. 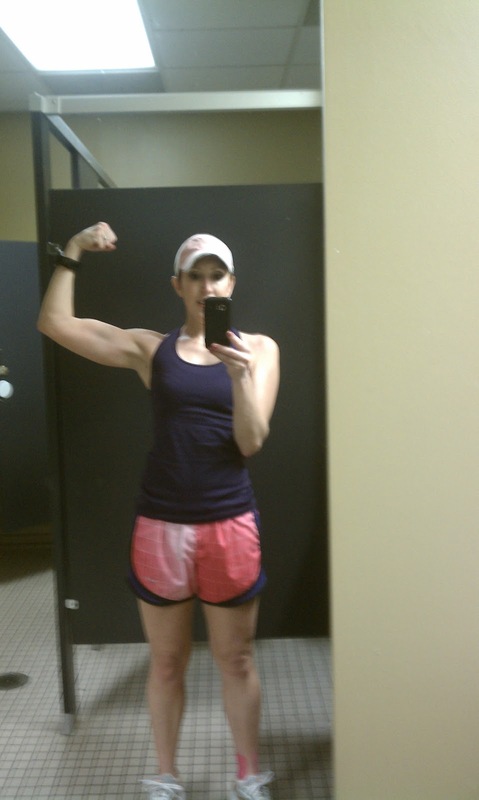 I was really still ho-hum during my warmup, but once I got going with the weights, I felt really good, strong. And it was nice having just a little bit of a change in the routine. Yesterday, when I went to the store, I randomly picked up some poblano peppers. Jason and I both really like them. 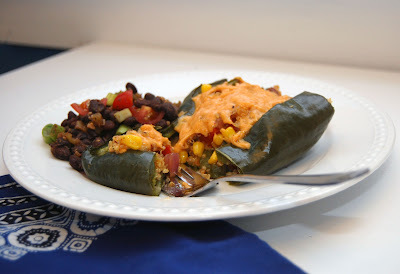 I haven't done stuffed poblano peppers in ages, so I thought it'd be a nice change of pace for tonight. I had originally planned on grilling, but it was raining. I will blame that on the fact that I actually washed my car yesterday. Remove the cap of the poblano pepper (reserve any usable piece and add to the onions and peppers if you wish). Then, cut a slit into the poblano peppers and remove ribs and seeds. Place in glass dish with lid and bake for approximately 20 minutes. In the meantime, cook the quinoa per package directions. Stuff the peppers with the mixture then top with Daiya Vegan Cheese. 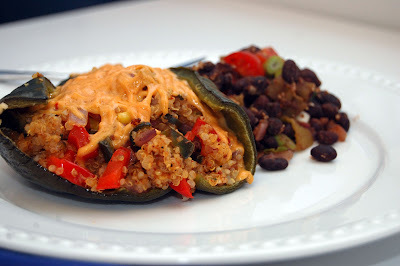 Cover and bake until the Daiya is fully melted and peppers are soft, approximately 20 minutes. Rather than adding black beans into the filling, I decided to make beans to serve on the side. All I did was rinse and drain one can of black beans. I sauteed some diced red onions with garlic then added in the beans, diced green chiles, and seasonings like salt, pepper, cumin, chili powder, and red pepper. When the beans were nice and soft, I removed from heat and sprinkled with diced green onions and some diced cherry tomatoes. Definitely happy with how this turned out. I was also really pleased with the beans. They would make for a great taco or burrito filling.